“Please, sir, I want some more.” — Illustration by George Cruikshank. The well known line from starving Oliver Twist, “Please, sir, I want some more” came to mind as I fired off yet another email to the elected councillors and council employees responsible for the design of the cycleway along Weyhill Road in Andover. The council want safety improvements. This scheme is a start; but as I’ve argued before, it is hardly good enough. So, with apologies to Dickens, having had a taste of improved cycling provision, and with certainty in the knowledge that I won’t appear in Pseuds Corner, I say: I’m hungry for some more road danger reduction. I asked for changes to the scheme before the decision was made last week by the councils to proceed; but they were all rejected. Risking insanity (and another rejection) I have ploughed on with a further request to the councils. More than a handful of people cycle in Cambridge. 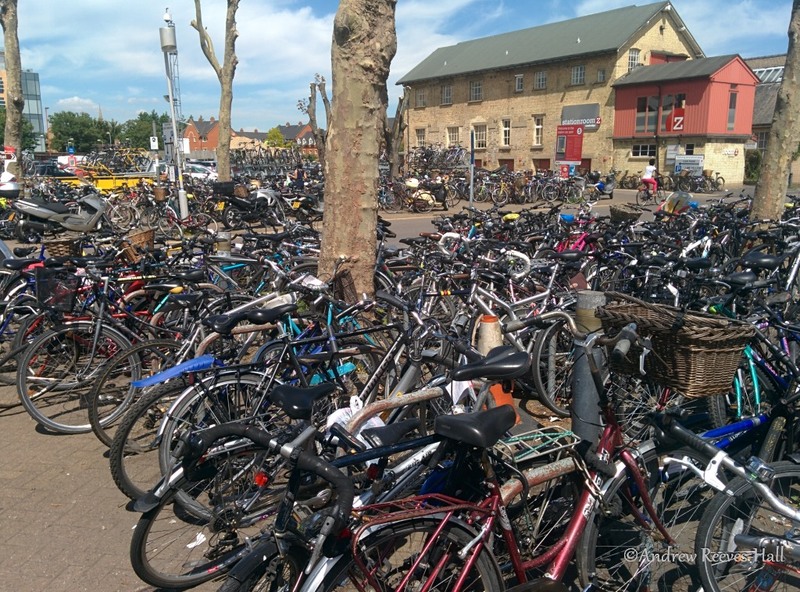 This is the bicycle parking at the railway station! By coincidence, I had a business trip to that well known cycling town of Cambridge last Friday. I took the train into London Waterloo and cycled to Kings Cross where I caught another train to reach Cambridge. I then cycled the 4 miles up to the area near the Science Park. Along the way, I kept my eyes open for cycling infrastructure that could be easily copied by the councils back home. 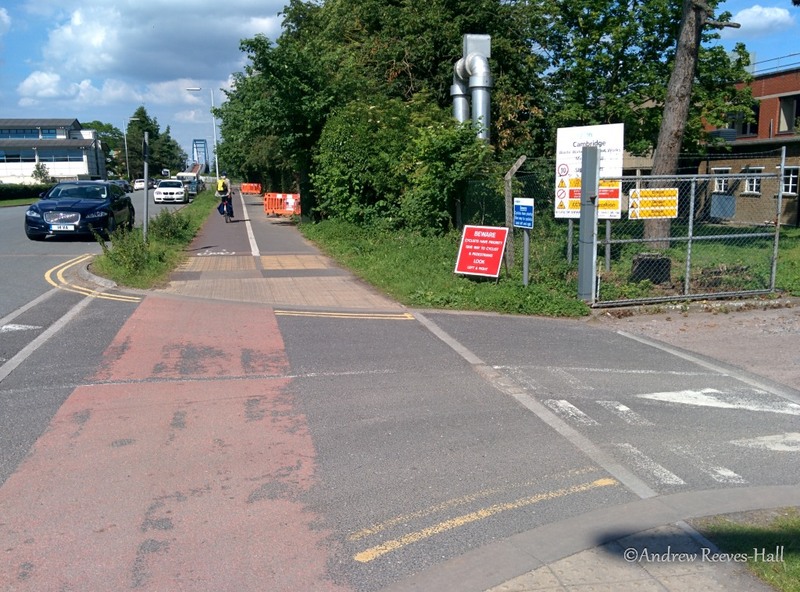 Copying Cambridge infrastructure isn’t as good as installing Dutch quality from the start – Cambridge ain’t no Netherlands – but it is a step towards it, something already in the UK, and something to build on: Please, sir, I want some more. Shared cycleway alongside Cowley Road, Cambridge. The piece of cycling infrastructure in Cambridge which caught my eye was a shared use cycleway along Cowley Road. The cycleway there is very similar to the one proposed for Weyhill Road in Andover: It is segregated from the main road and it is shared by people who ride and cycle in both directions. Today, I asked the councils to replicate it for Weyhill Road. The simple change to their plans is this: give people using the cycleway priority at intersections. To do that, I asked the councils to raise the road level up to the height of the cycleway and use road markings and signs to indicate the traffic priority. 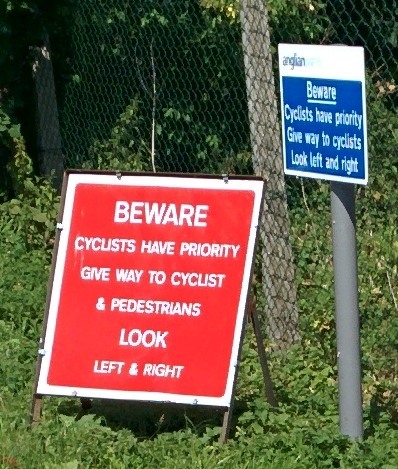 The priority of people on the cycleway is highlighted by signage. Anyone who travels out of, or into, a side road must give way to those on the cycleway. Just like they do in Cambridge. My emails to and from the councils involved in the Weyhill Road cycleway follow. My emphasis added. Last Friday I was visiting one of my customers in Cambridge. I took the train up there and rode out to their facility on my Brompton bicycle. I spotted on the way a shared cycle path similar to what you have approved for Weyhill Road in Andover. – there is signage indicating the priority. Can I ask please that you do the same for the Weyhill cycle path where it meets side roads? There is an argument to be made for these arrangements; however it is good practice to leave enough space for vehicles to give way at the cycleway after leaving the main carriageway. Otherwise you end up with vehicles coming to a stop on the main carriageway (risk of shunts), and the potential for cars turning with cyclists in their blind spot or simply not giving way (bad outcomes for the cyclist). I would not suggest giving cyclists priority crossing the side roads off Weyhill Road at present; it may be considered in the future if the route is well used. It is worth noting that in your example the cycleway crosses a private access into a gated area, not a public side road. There are no give way markings for vehicles exiting the main carriageway, the give way marked is on the side of a private access, and there is no space for a car to stop off the main carriageway. Indeed the signs are temporary and private respectively, and would indicate they are having some issues with cars not giving way to cyclists. The road marking and highway signs shown within the highway do not give any indication that vehicles have to give way to cyclists, except the coloured surface. It’s arguable that this ambiguity puts cyclists at an increased risk, in these situations in general and particularly in this example. Anyway, there’s hope in Hampshire. See the last comment here http://www.fixmystreet.com/report/273127 I’m intrigued to see whether this was “possible”. There’s always a get-out though isn’t there…. “in future if the route is well used”….. “if it is possible”. Be honest, HCC, we can all read between the lines. Quote: “There is an argument to be made for these arrangements; however it is good practice to leave enough space for vehicles to give way at the cycleway after leaving the main carriageway. That’s a statement full of contradictions. Presumably he’s against giving priority to the cycle track because in your case there is no space to allow vehicles to wait off the main carriageway and without blocking the track? And yet, apparently he seems happy to compromise on this safety issue if there are enough cyclists using the track – presumably enough that motor vehicles are almost guaranteed to have to wait in the main carriageway, increasing the risk of shunts above what the current risk would be with lower cyclist usage and shorter/less waiting time. Doesn’t add up really, does it?